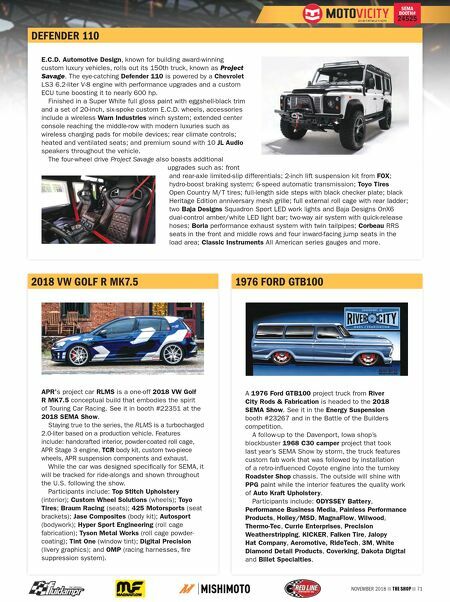 NOVEMBER 2018 THE SHOP 71 SEMA BOOTH# 24525 DEFENDER 110 E.C.D. Automotive Design, known for building award-winning custom luxury vehicles, rolls out its 150th truck, known as Project Savage. The eye-catching Defender 110 is powered by a Chevrolet LS3 6.2-liter V-8 engine with performance upgrades and a custom ECU tune boosting it to nearly 600 hp. Finished in a Super White full gloss paint with eggshell-black trim and a set of 20-inch, six-spoke custom E.C.D. wheels, accessories include a wireless Warn Industries winch system; extended center console reaching the middle-row with modern luxuries such as wireless charging pads for mobile devices; rear climate controls; heated and ventilated seats; and premium sound with 10 JL Audio speakers throughout the vehicle. The four-wheel drive Project Savage also boasts additional upgrades such as: front and rear-axle limited-slip differentials; 2-inch lift suspension kit from FOX; hydro-boost braking system; 6-speed automatic transmission; Toyo Tires Open Country M/T tires; full-length side steps with black checker plate; black Heritage Edition anniversary mesh grille; full external roll cage with rear ladder; two Baja Designs Squadron Sport LED work lights and Baja Designs OnX6 dual-control amber/white LED light bar; two-way air system with quick-release hoses; Borla performance exhaust system with twin tailpipes; Corbeau RRS seats in the front and middle rows and four inward-facing jump seats in the load area; Classic Instruments All American series gauges and more. 2018 VW GOLF R MK7.5 APR's project car RLMS is a one-off 2018 VW Golf R MK7.5 conceptual build that embodies the spirit of Touring Car Racing. 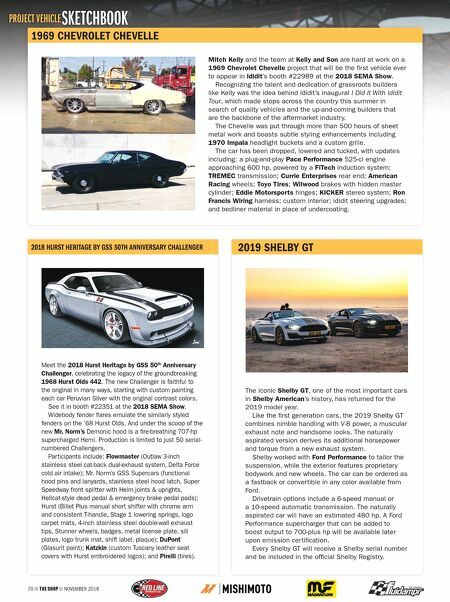 See it in booth #22351 at the 2018 SEMA Show. Staying true to the series, the RLMS is a turbocharged 2.0-liter based on a production vehicle. Features include: handcrafted interior, powder-coated roll cage, APR Stage 3 engine, TCR body kit, custom two-piece wheels, APR suspension components and exhaust. While the car was designed specifically for SEMA, it will be tracked for ride-alongs and shown throughout the U.S. following the show. Participants include: Top Stitch Upholstery (interior); Custom Wheel Solutions (wheels); Toyo Tires; Braum Racing (seats); 425 Motorsports (seat brackets); Jase Composites (body kit); Autosport (bodywork); Hyper Sport Engineering (roll cage fabrication); Tyson Metal Works (roll cage powder- coating); Tint One (window tint); Digital Precision (livery graphics); and OMP (racing harnesses, fire suppression system). 1976 FORD GTB100 A 1976 Ford GTB100 project truck from River City Rods & Fabrication is headed to the 2018 SEMA Show. See it in the Energy Suspension booth #23267 and in the Battle of the Builders competition. A follow-up to the Davenport, Iowa shop's blockbuster 1968 C30 camper project that took last year's SEMA Show by storm, the truck features custom fab work that was followed by installation of a retro-influenced Coyote engine into the turnkey Roadster Shop chassis. The outside will shine with PPG paint while the interior features the quality work of Auto Kraft Upholstery. Participants include: ODYSSEY Battery, Performance Business Media, Painless Performance Products, Holley/MSD, MagnaFlow, Wilwood, Thermo-Tec, Currie Enterprises, Precision Weatherstripping, KICKER, Falken Tire, Jalopy Hat Company, Aeromotive, RideTech, 3M, White Diamond Detail Products, Coverking, Dakota Digital and Billet Specialties.